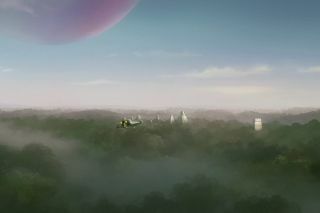 Season Four of "Star Wars Rebels" brings the crew of the Ghost to Yavin IV, the rebel base featured in "Star Wars Episode IV: A New Hope." The series is completing the backstory of the Rebellion. "Star Wars Rebels" opened its final season last month with a rescue mission, as the animated series closes out four years looking at the backstory behind the Rebel Alliance, which was first featured in the early "Star Wars" films. Although the story of the Alliance is a complex one, essentially the group is a faction of freedom fighters conducting raids and covert operations against the Galactic Empire, the fictional dictatorship and foil of the "Star Wars" franchise. Being a science fiction series, there is a fun element: Each side has access to "The Force," an energy field that connects all living beings. Practiced members can use The Force to do cool fighting moves. There's plenty of "Star Wars" universe content to look forward to in the coming years, including "The Last Jedi," which opens in theaters Dec. 15. But "Rebels" showrunner David Filoni expressed wistfulness about his series in an interview with ComingSoon.net. "I think – it sounds bleak, right – it's the beginning of the end. These stories, they're all told with the end in mind," he said, adding, "This season, to me, is one long movie. That's the way to think about it week to week." A season from the fourth season of "Star Wars Rebels." Nerdist adds that fans will be especially interested in the fates of the two Jedi freedom fighters who star in the series: Ezra Bridger (played by Taylor Gray) and Kanan Jerrus (Freddie Prinze Jr.) Mentor-mentee relationships are famous in "Star Wars"; Filoni told the website that Ezra will need to figure out how to use the powers Kanan taught him in this final season. The episode closed with Ezra lamenting that the battle was a failure, but Kanan pointing out that, in fact, it was a victory because the Rebels were still free. Kanan added that to keep that freedom, Ezra would need to continue to fight. The Season 4 opener then saw Ezra, Kanan and human Sabine Wren (Tiya Sircar) launching a rescue operation as the Empire reveals a new weapon. "The promise seems to be that by the end of this, [Ezra] will find a way to rid his world of the Empire. But we know that the Empire builds the Death Star, builds another Death Star, and they don't really get destroyed until Luke [Skywalker] does it [in the movies]," Filoni said to Nerdist. "How in the world does this kid find any kind of victory in the middle of this conflict? What does he consider a victory? How is he going to use his powers?" The next episode of "Star Wars Rebels" airs Tuesday (Nov. 14).